Matt Koleszar was raised in nearby Walled Lake, attended Saginaw Valley State University where he pursued his passion and graduated with a Bachelor’s degree focused on Social Studies at the secondary level. He started teaching at the Airport Community School District in neighboring Monroe County. While working at Airport, he pursued his Masters Degree in English Studies at Eastern Michigan University. He also serves as the President of the Airport Education Association, Middle School Cross Country and Baseball coach, and Quiz Bowl coach. From his 12 years in public education, he has watched the State Legislature pass bill after bill that harms the way our schools are funded, that interfere with local districts’ ability to negotiate classroom sizes and curriculum, and that leave our schools vulnerable at a time when they should be thriving. He is running for Michigan State Representative because it has become clear that Lansing no longer represents the average, hard-working Michigander, their values or their struggles, and it is time for everyday citizens to become the government they wish to represent them. Matt is the son of a single mother who balanced raising him with a full time job as an Operating Room Nurse and an entrepreneurial father who works in automotive supply sales. Matt and his wife, Kim, live in Plymouth Township along with their rescue pets; two cats, Truman and Kennedy, and an English Bulldog named Roosevelt. How Close is this Race? Clinton won House District 20 by 3.5% (nearly 2000 votes) in 2016. Republican newcomer Jeff Noble won the district by a 7.2% margin. Matt Koleszar will work on behalf of the citizens of District 20 and defend public education. With this district showing a strong support for Clinton in 2016, this race has a good chance of having a Democrat elected to the State House, if Democrats show up to the polls. Only by adequately funding public schools, creating a safe, gun-free zone, and eliminating the for-profit motive will the level of education in Michigan rise and allow us to take back the title of a top-10 education state. Provide adequate funding to improve the condition of our roads that we depend on to get to school and work. I vow to propose real solutions to solve the infrastructure crisis that we have all experienced first hand. Geography and Environment: HD 20 is located about halfway between Detroit and Ann Arbor, sitting on the intersection of I-276 and I-14. The two towns in the district, Northville and Plymouth are made of neighborhoods filled with well kept and spaced-out houses. From Northville, Detroit is a 40 minute drive away, as is Ann Arbor. 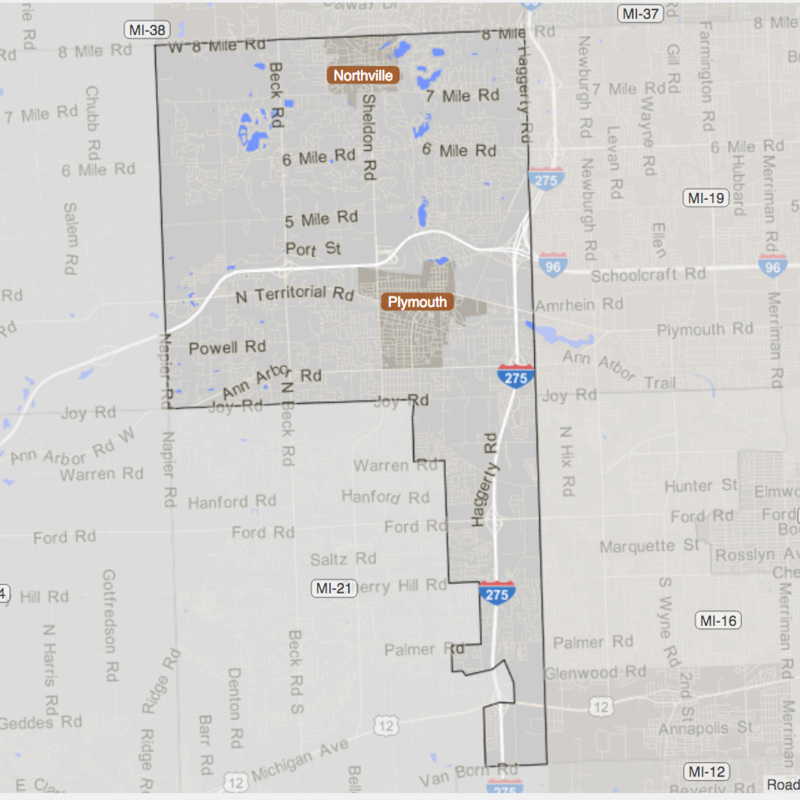 Citizenry: HD 20 isn’t very diverse, with 79.6% of the population being White. The Asian population is the second largest, at 9.3% followed by the Black population, at 5.9%. The age distribution shows the population leaning towards middle age, with 37.23% being between the ages 30-60. There is also a large youth population in the area (23.47% between 0-18, suggesting a large family presence in the area. Education: This is a highly educated district, with 58.7% of the population holding a degree higher that a high school degree. The area also appears to be getting more educated, as the younger generations are more likely to hold a higher degree than older generations, with those of the age of 65 or older having 15.2% chance of holding a Bachelor’s degree, while those between the ages of 25-34 have a 36.0% chance of holding a Bachelor’s degree. 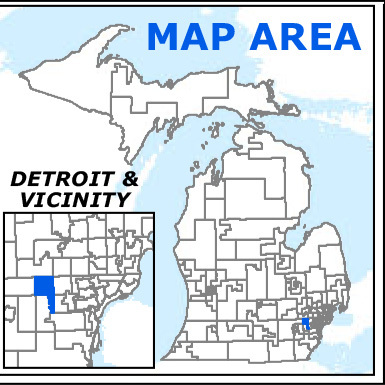 There are a few universities within Wayne county, and in close proximity to HD 20, including Davenport University, Eastern Michigan University, Madonna University, The Art Institute of Michigan, as well as University of Michigan in Ann Arbor and University of Detroit Mercy in Detroit. Economy : The median annual income in HD 20 is $77K. The highest earning ethnicity in the district are the American Indians, making a median of $135.6K annually, while the lowest earning population in the Black population, making a median of $51K annually, as well as having a 8.90% unemployment rate, compared to the districts 5.0% total unemployment rate, or the 2.47% Hispanic unemployment rate. The largest employing industries in the district are manufacturing (19.5% of employees in the district), healthcare (14.3%), and professional and education (both 10.5%). Of the households in HD 20, 5.4% receive food stamps, with a median income of those households being $24.8K annually. Health status: Wayne County, which includes HD 20, has 7.1% of it’s population without health insurance, and 12.4% with a disability. As a county, it ranks at the very bottom of Michigan counties in health. Transportation: Wayne County has an average commute time of 25.5 minutes, crumbling infrastructure, and a patchwork bus network. Evangelical ideologue is the best way to describe first term Michigan House Representative Jeff Noble. He has been labeled as a Tea Party politician who wants to establish a theocracy. Although he tries to deny those claims, his voting record, the people with whom he associates, statements he has made, and passages from his church website all lend a great deal of credence to that characterization. Noble has been the lead pastor of three Christian churches within District 20—first the Main Street Baptist Church in Canton from 1999 to 2008, then Praise Baptist Church in Plymouth from 2008 to 2017, and now Four Winds Church in Northville. When the congregation at Main Street outgrew its building, Noble led a capital campaign to build a new church. When the financing requirements of the bank proved to be too onerous, Noble helped facilitate a merger with Praise Baptist, a church that owned a building but was experiencing a declining congregation. Just this year Noble left Praise Baptist to start a new church in Northville. It is currently housed in a converted movie theater. 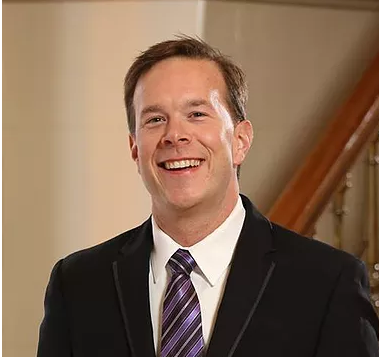 Noble was ranked as the most conservative member of the Michigan House of Representatives by the publication Inside Michigan Politics, and he received a high rating of 88% from Americans for Prosperity, a libertarian political advocacy group founded by the Koch brothers. Noble’s ultra-conservative religious beliefs permeate his political views and blur the line between church and state. Based on his church website, Noble believes in the literal interpretation of the Bible (which would include Creationism). He believes that Christianity is the only legitimate faith and that non-Christians are doomed to hell. Most significantly, he believes that the United States was founded as a Christian nation, that government should be run by leaders who adhere to “the Judaeo-Christian values that defined the United States of America,” and that Christian ministers should be allowed to advise their congregation on how to vote, including evaluating which party’s platform best embodies the teachings of the Bible. Noble is the only candidate for Michigan House District 20 to have been endorsed by the National Association for Gun Rights and to have received an A rating from the NRA. Noble joined 11 of his colleagues in the House to co-sponsor a resolution urging the U.S. Congress to repeal the Affordable Care Act (a resolution that never got out of committee—HR 0013). Noble is 100% “pro-life” and has the endorsement of the Michigan Right to Life organization. He also opposes gay marriage. Republican trifecta control of Michigan (Governor, Senate and House) has resulted in a bad economy, deteriorating roads and infrastructure, a devastated educational system riddled with non-performing for-profit charters, and polluted water. It's time to bring Democrats back to clean up the mess and create opportunity for all Michigan residents. Infrastructure Comprehensive plan to repair and replace our roads and bridges and protect from further deterioration. Doesn't support tax hikes to fund roads and infrastructure projects. Sponsored legislation to create a grant program for road projects by local governments who want to experiment with alternative “innovative” materials. Healthcare Fight to lower prescription drug prices and address the opioid epidemic. Comprehensive and thorough healthcare system that will help every Michigander. 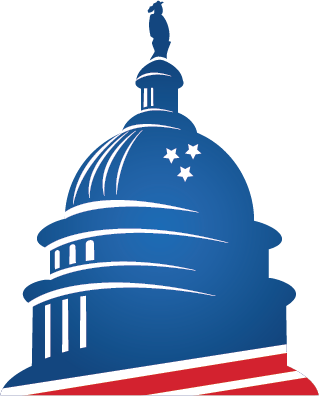 Noble opposes all forms of government regulation, including those that protect public health and the environment. Advocates for the elimination of social assistance programs including healthcare for the poor and the Affordable Care Act. 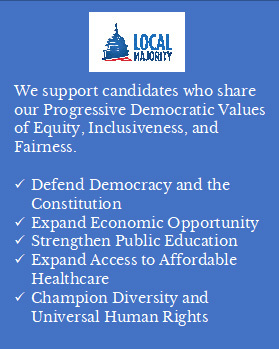 Take Action for Progressive Change! Vote Blue!